Our free Bill Pay makes managing your money simple! Take care of business from your computer or mobile device within online banking. Or click here to register for Online Banking. After completing the registration process, you will receive an email confirmation, letting you know that you can start setting up your payments. Unlike other auto payments options, you get the flexibility of determining how much you want to pay and when. Tired of snail mail? Get bills delivered straight to your computer or mobile device. Avoid the hassle of remembering multiple logins. 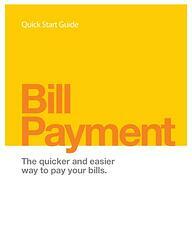 Pay all your bills in one convenient location. Pay a bill just once or schedule automatic payments each month. Avoid sharing your information with multiple billers. You’ll be protected by the same standards that secure your online account. Add, delete, or edit your payments. You can modify them any time before your payment clears. By going paperless, you could be part of the movement to save millions of trees each year. We'll keep track of your past payments, so you can review them if you need to. Avoid late payments by setting up email reminders that alert you when your bills are due. Need help getting started? These step-by-step instructions will have you paying your bills in no time. To sign up, simply log in to Online Banking and select the Bill Pay tab. A welcome screen will appear for first users. Read and accept the explanation of service to continue. Then, enter your information and click Submit to enroll. How do I pay someone new? To add a new payee, type the name of the person or company in the “Need to pay someone new?” field at the top of the main bill pay page and click Add. Fill out the form, click the Add payee button and you are ready to make a payment. Note: If you don't have any payees set up, or just a few, we will suggest some common payees at the bottom of the page. If you see your payee there, click their name to begin the add payee process. Why can't I edit my payee's address? When adding a payee (or trying to edit your payee later), don't be alarmed if we do not ask you for an address to which to send your payment. This just means that we have a relationship with this payee where we either pay them electronically, or the payee asked us to send payments to an address that might not match the address they give you on your bill. Are there any types of payments I can't make? We will not notify you if you attempt to make any of these payments and we will not be liable for these prohibited or discouraged payments. Tell us the day you want your payment sent and we take care of the rest. Use our calendar widget when scheduling payments to assist in understanding when a payment can be delivered. Available dates will be displayed in blue. Unavailable dates including weekends, holidays, or a date that would not allow us to deliver the payment in time are grayed out and not selectable. Electronic payments: If we make your payment electronically, your account is debited on the day you scheduled that it be sent. Check payments: The funds will be debited from your account one (1) to two (2) days after the send on date. Note: To determine if a payment will be paid electronically or by check, locate the payment in the "Scheduled payments" section of the main page and click the edit icon. How a payment is scheduled to be made, electronic or check, will display in the pop-up box next to "Type." An eBill is an electronic copy of your paper bill that you can view anytime from within the Bill Pay service. eBills are a secure and convenient way to keep all of your bills in one place. You will be notified when an eBill arrives and when it is due so you never have a late payment. How long do you store my history and eBills? The last 24 months of payment history and eBills are available online for you to view. If for some reason you need payment information dating back past 24 months, give us a call and we will help you retrieve that information. How can I choose what notifications are sent to me? We send many types of notifications and alerts to you via email to keep you informed and up to date regarding your payments. Some alerts are system generated and cannot be turned off, but there are many others you can choose to "turn on" or "turn off." More information on managing your notifications, . You can change your email address by clicking on the My Settings link in the header of the main bill pay page. How do I manage my payees? Find the payee in your list and click on its corresponding Options link. Your Bill (eBill): enroll/edit/un-enroll. This tab only appears if an eBill is available for the payee. Next due reminder: add/edit/delete a next due reminder. Automatic payment: add/edit/delete a recurring payment rule for a payee. Expedited payment: send an expedited electronic or overnight check to a payee. Account Information: add/edit your payee account information. Delete payee: permanently deletes this payee from the system. If you need to make a subsequent payment to a deleted payee, you will need to add that payee again. Hide payee: hides your payee from your payee list – a way to manage a long list of payees. A checking account and Online Banking access are required in order to use Bill Pay services.